Last night after work I really wanted to go out and work in the garden. But it was just so hot that I couldn’t make myself do it. So I read for awhile before making dinner. I just started The Girl with the Dragon Tattoo this week. I had to wait forever to get it from the library. I feel like I’m the only person who hasn’t read it yet. Have you read that book? What did you think? Don’t tell me any spoilers! When it was time to make dinner I decided to make Baltimorean Beans & Rice with the black eyed peas I cooked up on Monday. That meant I did have to go out to the garden so I meandered on out there to get a handful of kale while the rice was cooking. This is the second time I’ve made this dish and I really enjoy it. It’s very easy to pull together and it has whole grains, protein and greens all in one dish. After dinner I convinced Benzo to go on a walk. I’ve been trying to get him to go on walks after dinner as a way to get a little more exercise in the day. Before yesterday he hasn’t been very receptive. But he must have changed his mind and off we went down the street. We walked for about 30 minutes or so. Not fast, just a nice easy pace. Walks are not only great for exercise but they are also great for talking. We talked about a lot of things in our lives and it was just really nice. Luckily it had cooled off a bit so we weren’t baking! After the walk we both wanted some dessert and so now we finally arrive at the subject of this post! I have been wanting to try chocolate-avocado pudding ever since I first read about it on someone’s blog (I can’t remember which one). It just sounds so interesting because I normally associate avocado with savory dishes, not sweet desserts. Put the first four ingredients in a blender, food processor or Magic Bullet. Add 1 tbsp water and blend. Continue adding water one tbsp at a time until pudding reaches desired consistency. I ended up using 5 tbsp total but you may need more or less. Here I am in action putting everything in the Magic Bullet. Thanks to Benzo for being the photographer of the evening. The Magic Bullet had a little trouble whipping the pudding together. I used the chopping blade and maybe that was my problem. Maybe I should have used the whipping blade. In the end it blended up just fine, I just had to shake the ingredients around several times to get them back down to the blade. Here is the finished product. So creamy! So the million dollar question is, how did it taste? In Benzo’s words “This is un-frickin’ believeable!” I didn’t think it tasted like avocado at all and neither did he. 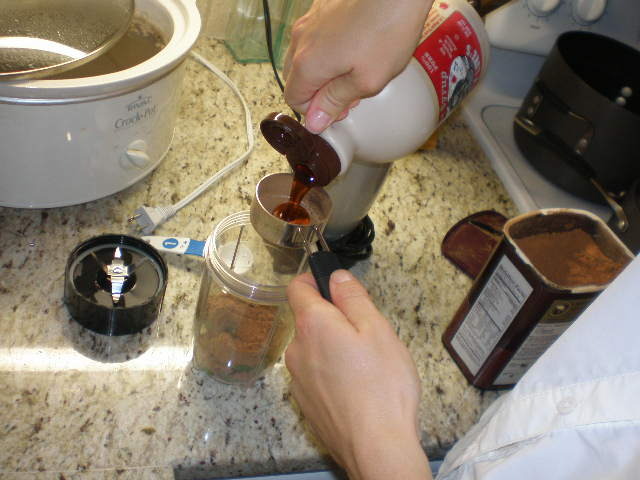 We both thought it was a little on the bitter side, so next time I will either add more sweetener or reduce the amount of cocoa powder. The texture was amazing. 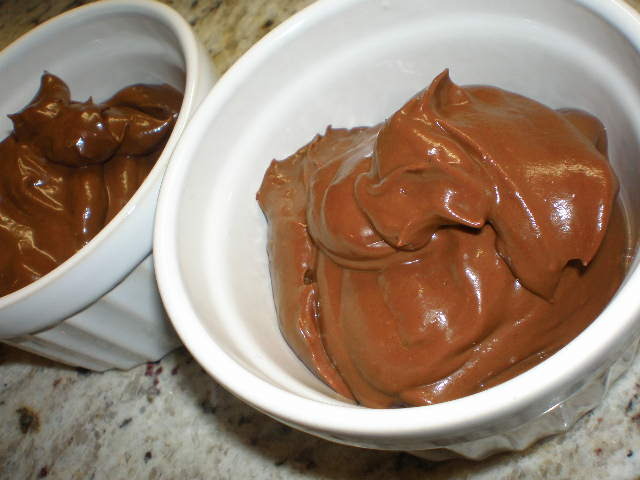 Completely smooth and creamy, just like chocolate pudding. We both really liked it. And talk about a healthy treat! Healthy fats in the avocado and antioxidants in the cocoa powder combine to make a completely guilt-free dessert in my eyes. Not that I ever feel guilty about eating dessert. If I want it, I eat it. But this chococado pudding may be my new summer treat, especially since I can whip it together in about 5 minutes. I wonder how it would taste frozen?? I feel like this chococado pudding has also opened my eyes to a whole new way of cooking. Now I’m dreaming about all the lovely creamy things I can make by using avocado instead of traditional cream. I need to get some more avocados pronto! Are there any non-traditional dishes that you make with avocado instead of the usual ingredients? P.S. I was recently featured in an article over at Women’s Day on comfort food turned healthy. Can you guess what I submitted as my health-ified comfort food? It was something I made here recently. Click over to find out and also to check out the other bloggers’ better-for-you comfort foods. Did you try to freeze it? If so, Did it work? I have not tried freezing it, but that’s a good idea! I will try to remember next time.